Garden maintenance isn’t the easiest thing to do, especially when there are a number of issues to be handled. Well, there is always an easier solution at least for the residents of the Marylebone area because our company offers you our impeccable gardening services. All our gardeners have years of experience in the business. They are here for you whether you need some lawn mowing and general garden maintenance or you need help with re-designing the entire garden. With our flawless service, we are targeting those who want the best value for their money. 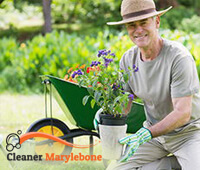 Our gardeners are a trusted name in the Marylebone area. They are on your service seven days a week with a flexible schedule and no extra charges in the weekend. Just give us a list of your requirements and enjoy the beautiful transformation of your garden. When re-designing the garden we can help you choose a variety of plants. Some plants are better for certain climates and depending on the quantity of the daylight your garden receives. Only an experienced gardener can choose the right one. If you’re having a dog, you will probably see these brown spots on the lawn. Our gardeners will remove these spots by re-planting the grass and fertilizing the spots. They can also aerate the lawn by using special tools that will let the grass root ‘’breath’’ more oxygen which will make it grow bigger and better. We are using only state of the art lawn mowers with different sizes depending on the size of your garden. Your garden should be a private oasis where you can spend some quality time with friends and family and can do barbeque evenings. 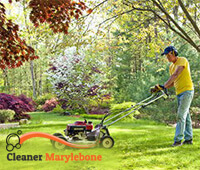 Why you should hassle when here are our great gardeners who operate in the Marylebone area. Just pick up the phone and call our operators and don’t forget to ask for your completely free quote.